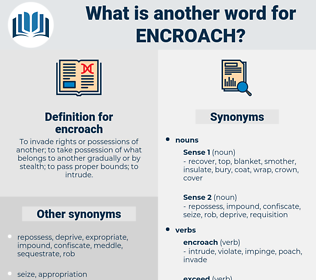 What is another word for encroach? To invade rights or possessions of another; to take possession of what belongs to another gradually or by stealth; to pass proper bounds; to intrude. protrude, invade, meddle, trespass, violate, usurp, impair, intervene, prejudice, detract, affect, overlap, diminish, endanger, breach, jeopardize. But with Klaus Heinrich they were strong and emphatic, so that they seemed somewhat to encroach upon, to narrow and to lengthen his steel - coloured eyes. More than once the growth of the college buildings had threatened to encroach upon Old Top; but the big elm held its prior claim, and new dormitory or infirmary was set back that it might rule with kingly right in its historic place. 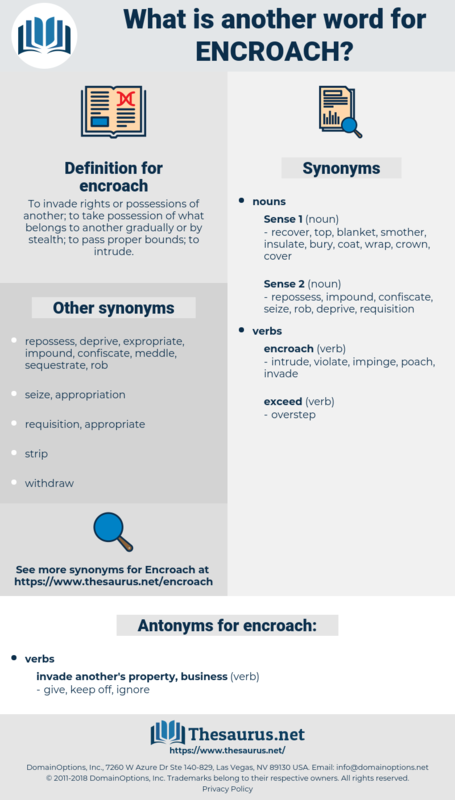 engross, eminence grise, encourage, engorge. move on, march on, advance, go on, progress, pass on.